Trainer Danny O’Brien has defended Shamus Award after the three-year-old’s sixth in Saturday’s Australian Cup. 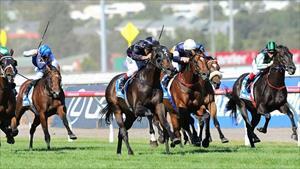 The Cox Plate winner led until the final 100m before being swamped by five horses, including the winner Fiorente. O’Brien said the star colt, who won the Australian Guineas at his previous start, had not tarnished his reputation. “He didn’t lose anything in our eyes. I thought it was a ­terrific effort,” he said. “Green Moon really put the pressure on him for most of the race and he kicked clear of him in the straight. It was only in the last 100m that they reeled him in. O’Brien said he would stick to his plan of running Shamus Award in the 2000m Rosehill Guineas on March 29. “He’ll be going back to three-year-olds and I’m very confident he would win that race,” he said, adding that a run in the $4 million Queen Elizabeth Stakes (2000m) at Randwick on April 19 would depend on how he raced at Rosehill. O’Brien was also far from disappointed with his other stable star, Shamexpress, who ran fourth in Saturday’s Newmarket Handicap. “I would have liked to see him settle a bit further back in the run, but it was through no fault of Damien’s (Oliver) that he ended up where he did,” O’Brien said. “He’s better when he settles a bit further back but, after he jumped so well, it just worked out that nothing behind him was going forward so we had to take up that position. “Regardless, even if he settled a bit further back, he couldn’t have beaten Lankan Rupee. Shamexpress will run in Friday week’s William Reid Stakes (1200m) at Moonee Valley ­before heading to Sydney for the T.J. Smith Stakes (1200m) at Randwick on April 12. “That race (William Reid) was always on our agenda as it would be five weeks before going into the T.J. Smith,” O’Brien said.